In the previous pAsuram, AzhwAr spoke about the way thrivikrama controlled mahAbali. In this pAsuram, he talks about how SrI rAma controlled the demons. pin thurakkum kARRihandha sUl koNdal pErndhum pOy van thiraikkaN vandhaNaindha vAymaiththe . . . . paran – The first two lines are to be considered as the analogy and the last two lines as the subject. The meaning of the last two lines is – sarvESvaran (lord of all), who has the wealth of victory and the reddish divine disc, has the greatness of having severed the cruel demon sUrpaNakA’s nose and stout ears. The meaning of the first two lines is – it appears that water laden cloud, which has lost the air that was pushing it from behind, comes back over the ocean which has strong waves, in a fitting way. In the first interpretation, since the term paran which denotes a sentient entity has been used, the term vAymaiththE has been changed to vAymaiyyan and the meaning for the pAsuram is considered as follows: SrI rAma, who destroyed the demons and returned to thiruppARkadal has the analogy of cloud, which, after separating from air which pushes it from behind (as a prime mover), goes back to the ocean. The second interpretation involves adding the word padi (nature) to the last word paran and getting the meaning as given in the text – the nature of SrI rAma is similar to the nature of cloud. The water laden cloud (which reached the ocean) after losing the air which pushes it from behind is similar to SrI rAma, who, after severing the nose and stout ears of the cruel demon sUrpaNakA, reached thiruppARkadal again (at the end of his incarnation). Just as AzhwAr had linked the stars to thrivikrama’s incarnation in the 61st pAsuram, he links the cloud, which reaches ocean after losing its prime-mover air, to SrI rAma’s incarnation. The words van thiraikkaN vandhaNaindha are common to both the water laden cloud and rAmAvathAram (incarnation of Sri rAma) since both reach the ocean at the end. Air, which pushes the cloud from behind, helps it to roam around in the skies. In the same way, the prayers of celestial entities enable the incarnation of SrI rAma. Once their prayers have been answered, SrI rAma too, just like the cloud which has lost air, returns to thiruppARkadal. 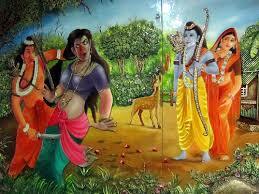 Just as the cloud is laden with water (for raining), SrI rAma is laden with mercy (which he showers on all). Thus, we can see that both the subject and the analogy are congruent in all aspects. The reference to severing of sUrpaNakA’s nose and ears is indicative of SrI rAma’s annihilating all the demons, down to rAvaNa. We will take up the 64th pAsuram next. This entry was posted in iyaRpA, periya thiruvandhAdhi on January 14, 2019 by T N Krishnan.